Many companies are interested in leveraging AI for their business, in particular for automating their customer service. It’s however not really clear, which aspects should be taken into consideration in the project discovery phase. Any business project can go sour due to unrealistic deadlines and scope creep, but it’s particularly important to be mindful about the potential project risks when venturing to a whole new area of technology. 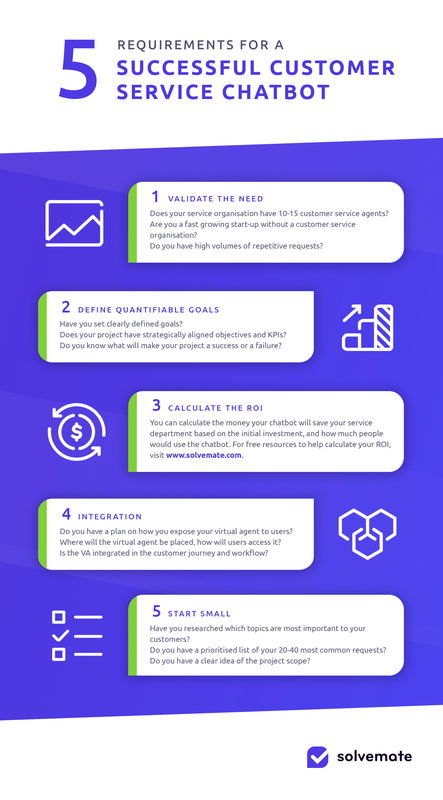 So, to ensure your chatbot project is a success, go ahead check out our infographic and follow these prerequisites in your own chatbot project! For both of these use cases, the base tenets are the same: large quantities of repetitive questions with relatively simple answers. In both cases, the volumes of the recurring questions are a mismatch with the number of human agents and their competences. In addition, an established customer service organisation will have the problems of an established customer service: high staff turnover, global customers, high costs of training new staff and demand fluctuation. The startup might share some of these issues, and setting up a virtual agent as a “gatekeeper” to the customer service will help curb the growing pains and the number of human agents can be scaled up as needed, without having to sacrifice the quality of service. So you’re sure you need a virtual agent? Good. Next up is setting goals. Setting objectives is a necessary prerequisite for any project - a chatbot project is no different. Even though artificial intelligence and machine learning are fancy new buzzwords, there is in fact no reason to look at your chatbot project as anything else than a normal business project. It follows all the same items through the project timeline: initiation, defining requirements & planning, execution, performance tracking all the way to closing it. When defining the requirements, think long and hard - what do you want to achieve? It brings little value to your company and department to just say, “We want a chatbot”, rather than clearly quantifying what is expected as an outcome of this project. Maybe you want to reduce your contact ratio by 30%, or to decrease the demand of your human agents by 20%. Maybe you want to service your new markets in their native language, without hiring new staff. Whatever it is, make sure it’s clearly defined - ideally with numbers. You need to know what makes your chatbot a success - and what makes it a failure. As we’ve established that a chatbot is a normal business project, it also needs an ROI calculation. Only chatbots with positive ROIs are happy chatbots. All chatbots first incur costs, so it’s an important part of the project discovery phase to calculate their ROI before execution and implementation. Calculating the ROI is perhaps not as simple as it is for other projects, but we’ve created a handy Excel-file to get you started. As sample inputs, we’ve added a case of using Solvemate for a generic “Growth” customer. Spoiler: our customer sees a payback within a few months time. Download the calculation. Please note that this calculation only applies to text-based customer service chatbots. In your ROI calculation, you should look at the following key parameters: salaries, numbers of requests & number of agents, as well as the routing requests and resolution rates for the bot. You should also find a way to differentiate between the “self-service requests” (f.ex. resetting password) and the “need-agent requests” (f.ex. cancelling an order) that end up in your service queues. For a detailed step-by-step explanation on how to use the Excel-sheet & perform the calculation, check out this article. Make sure your expose your virtual agent to as many people as possible. It’s an all too common scenario: a company decides to invest in a chatbot, plans the project, spends the project money, spends the resources, sets it up & trains it. With some service providers, this alone can take months. Finally, the bot is sent out to the world to interact with your customers. And in the end? Nobody is using the virtual agent. Your customers cannot even find it. The virtual agent gets a couple a few dozen of interactions per week out of thousands. Nobody got what they wanted - and the project is a failure. Why does this happen? In retrospect, it’s usually quite simple: the virtual agent was never integrated in the customer journey and the workflow of your customers. If possible, involve a UI / UX / CX or a service designer in your project to make sure the chatbot is put center stage. The point of the whole bot is that your customers use it - prioritise it as a point of contact and promote it to your customers at the crucial moments in their customer journey and in your contact nodes. Perhaps counterintuitively, start small. You craft your list of top 20 or top 40 most common requests, but in the end you don’t know 100% how your customers will interact with your virtual agent. Don’t expect to provide 100 different solutions to your customers from the get-go. We know from experience that there is some variance between what the type of requests you get in your call center, and what type of requests your virtual agent encounters. So, start small: train a few solutions and few problems and incrementally iterate your agent, expanding both your question & solution base. With the right service provider, this can be hassle-free; the virtual agent in fact gathers feedback and suggests further training predictively and autonomously. If your organisation is still searching for the right chatbot vendor, I suggest you find out what Solvemate's virtual agent can do for you. As said, a chatbot project is very similar to any other business project you’ve conducted in the past - finding the right vendor is the ultimate requirement, worthy of its own blog post. After that, just make sure these requirements are met and make that project a success!